A Southern Leopard Frog sits in a puddle at Millington WMA. The Southern Leopard Frog (Lithobates sphenocephalus) is at the northern extent of its U.S. range in Maryland. The Southern Leopard is common in the southeastern part of the U.S. and is not found north of Maryland. 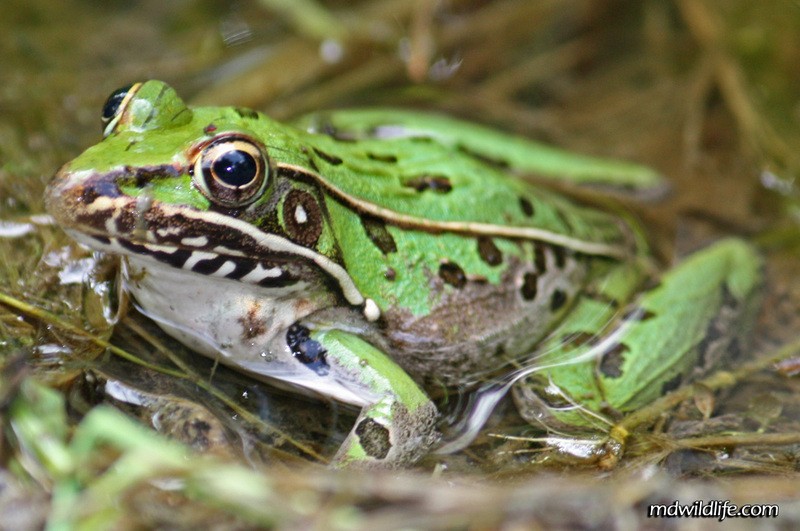 Within the state, it is likely you will only see the Southern Leopard Frog along the eastern portion of Maryland, along the Chesapeake watershed bordering Delaware. Physically, the southern leopard is only a few inches long. The frog may have either green or brown skin and black splotches all over its body, which give the frog its “leopard” name. I photographed the one above in a large puddle along the path at the entrance to Millington WMA. Millington’s marshy terrain and thicky grassy areas are obviously a very convenient habitat for frogs and toads. I think I have captured a southern leopard, fowler or Eastern American Toad everytime I have been there. With dozens of puddles lining the walkways, amphibian and reptile spotting can be great. The best way to tell if you have a frog or a toad is the skin. Toads will often be covered with bumpy warts, while a frogs skin is much smoother. ɦ&#6513ге. Тɦе ѕκetϲɦ iѕ tаѕtеfսl, үο&#6489г ɑutɦоreԀ mɑtеrіal ѕtү&#8572іѕҺ. уoս wiѕh Ƅ&#6513 ɗe&#8572іνегіng the f&#1086&#8572&#8572&#11423&#7457ing.